For referrals, click here to fill out our Online Patient Referral Form. University Orthopedics in Providence, Rhode Island, is a regional referral center for patients with back and neck pain, joint pain, sports medicine problems, shoulder pain, hand problems, hip and knee pain, and foot and ankle injury. 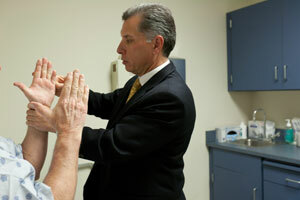 The orthopedic center includes more than 25 board-certified orthopedic surgeons. Many of our specialists are fellowship-trained, the highest level of medical training in the U.S. The University Orthopedics physicians are clinical professors on the faculty of Brown University’s medical school and serve as teachers of other new physicians. Our team of providers are leading the way with clinical research on the latest advances in orthopedic surgery and injury prevention. Philosophically, University Orthopedics has for decades believed in the important connection between academic medicine, private practice and clinical research. Acting as the head of the Department of Orthopedics at Brown Alpert Medical School, University Orthopedics directs many clinical research efforts intended to innovate new orthopedic surgery techniques; new surgical implant devices that improve the success of various procedures; and new ways to prevent orthopedic injury. Our Web site has several points of interest for referring physicians to University Orthopedics. Overview of University Orthopedics and how it can be a resource for you and your patients. This includes information on all our physicians, how to refer a patient to any of our physicians, or how to refer a patient directly into our specialized physical therapy department. E-consult. As the expert source for information about all types of back and neck problems, University Orthopedics physicians provide a free service to referring physicians only. We are able to answer physician questions via e-mail through this INTRANET site. Please contact us to request Physician Login information for the University Orthopedics Econsult. Click here if you know your Username and Password for our E-Consult service. Clinical outcome and patient severity data. We will be sharing patient severity data that shows the severity of patients entering University Orthopedics for their first appointment, along with clinical outcome information. If you have a patient with a complex back or neck problem, joint pain, sports injury, shoulder pain, hand problems, hip and knee pain, or foot and ankle injury who requires surgery or may need a consult for a complex problem, you can now access the expertise of University Orthopedics for the benefit of your patient. Click on the e-consult link to send us an e-mail inquiry about a patient. University Orthopedics takes a multidisciplinary team approach to orthopedic care through our specialty centers. 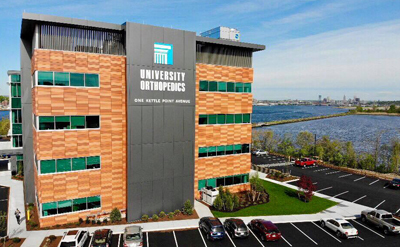 By virtue of our subspecialists, University Orthopedics is often referred the most complex orthopedic injuries from across Rhode Island, Connecticut and Massachusetts. Our goal is to provide the most advanced orthopedic care to your patient before returning the patient to your care.